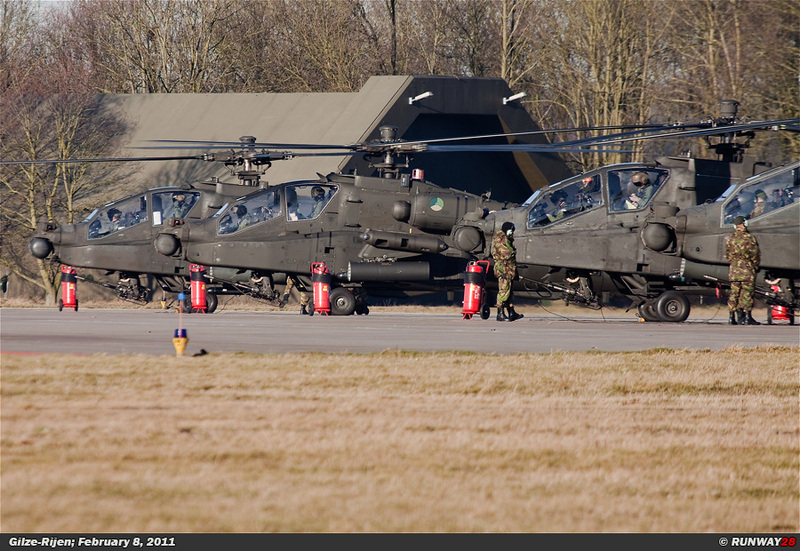 On Tuesday, February 8, 2011, I went to Gilze-Rijen to see the based helicopters. 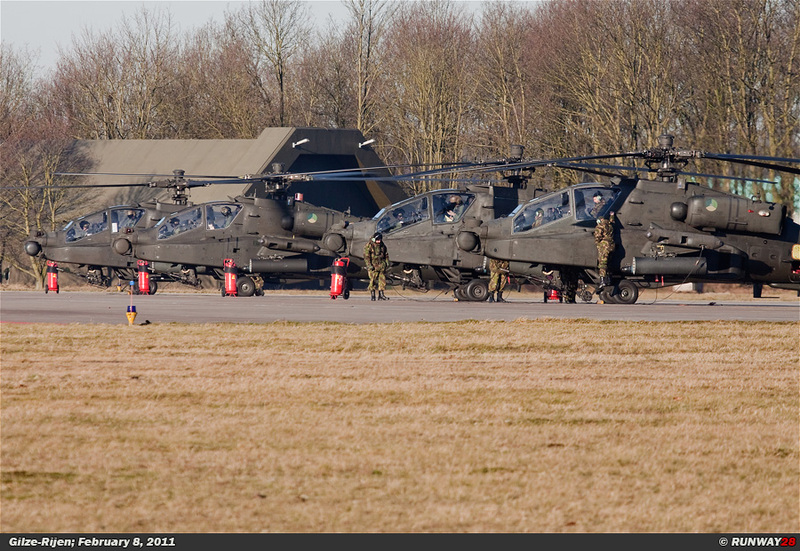 I was lucky that today a lot of Apaches were active at the base. 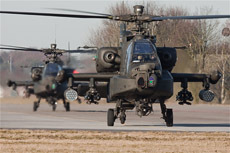 Four Apache helicopters would leave the base within thirty minutes. It is very easy to take decent photos at the head of the runway at Gilze-Rijen; especially in the morning hours. 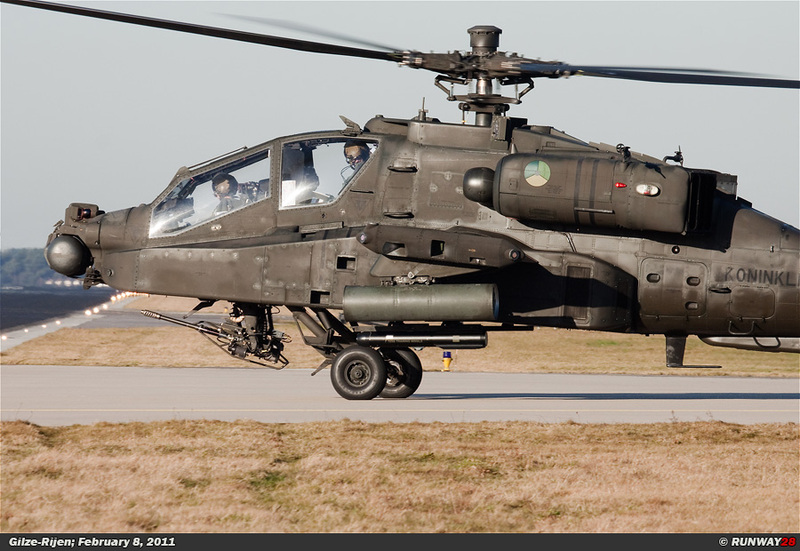 The Boeing Defense & Space Industries (formerly Hughes and McDonnell Douglas) AH-64A Apache is one of the main attack helicopters of the United States Army. The helicopter was designed with one mission, namely: the destruction of all kinds of ground targets. The helicopter can perform its tasks at any moment of the day and under bad weather conditions. This is possible due to a unique integrated information system where flight information is projected on the visor of the helmet. 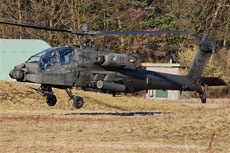 The Apache can be used for different tasks, such as; acting as an armed scout, controlling areas, escorting convoys, providing air support for ground troops and the elimination of several ground targets. 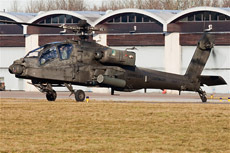 The Apache came in the United States into use as a replacement for the AH-1 Cobra. The helicopter also entered service in countries like Egypt, England, Greece, Israel, Japan, Kuwait, The Netherlands, Saudi Arabia, Singapore and the United Arab Emirates. 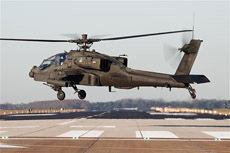 The AH-64 is equipped with modern avionics, such as; target-finding equipment, night vision equipment, radar jammers, infrared immune systems and GPS. The most important system is the Target Acquisition and Designation System (TADS). It is possible to find targets by using infra red images and video with this system. The targets are designated by a laser beam. 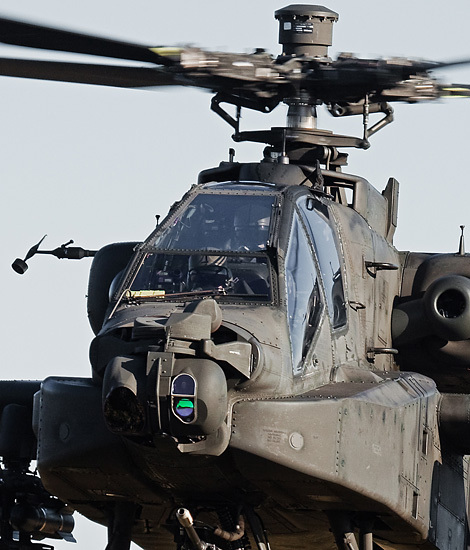 The IHADSS (Integrated Helmet And Display Sight System) plays an important role for the Apache. The helmet display allows the pilot to navigate at night under adverse weather conditions. 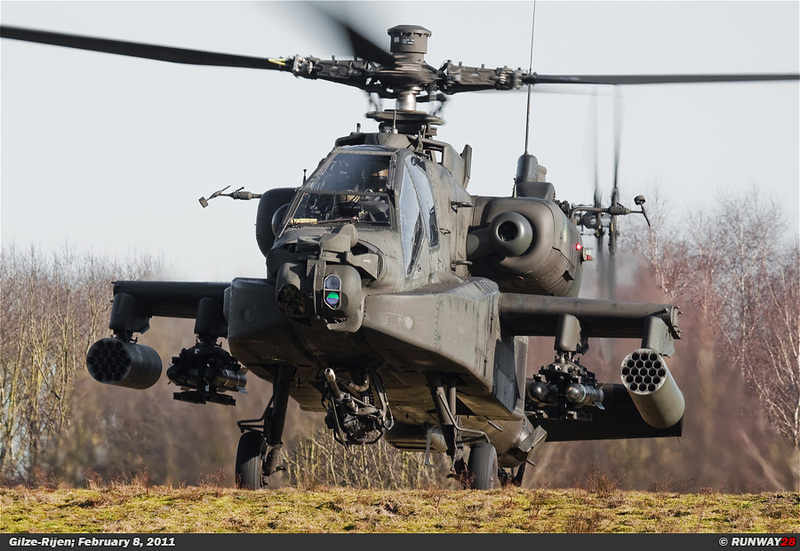 The electro-optical head tracking system controls the data traffic between sensors and weapon systems in the Apache. 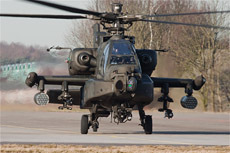 The laser target pointer is suitable for the designation of targets for the Hellfire missiles from the Apache or laser guided bombs from other aircraft. 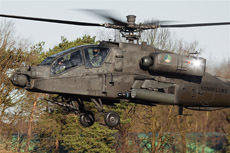 The disadvantage of this system is that the pilot needs visual contact with the enemy; this can make the Apache a vulnerable target to enemy fire. 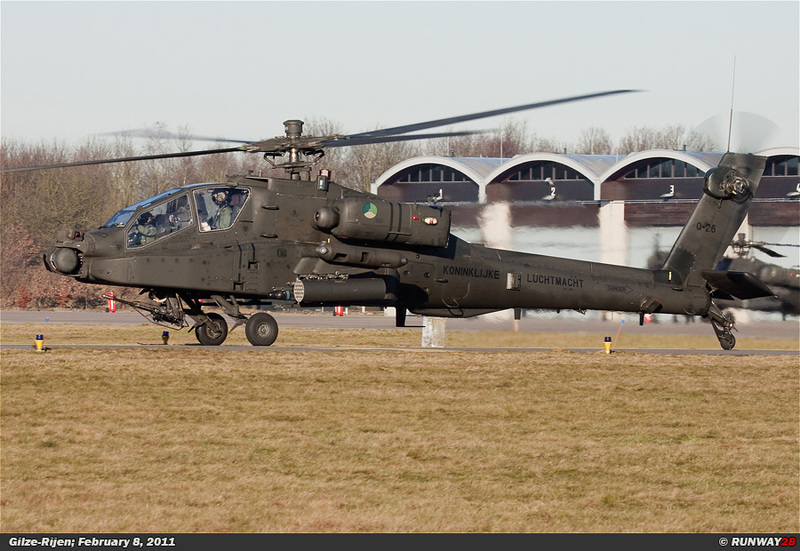 TADS is therefore a system which is used as a backup system in the AH-64D Longbow. 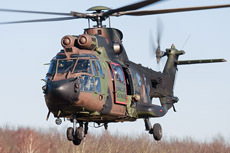 The primary system of this helicopter is the SHF Westinghouse radar which installed on top of the rotor head. 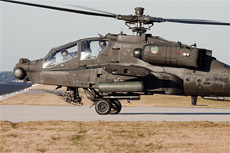 The longbow uses the Hellfire II missile. 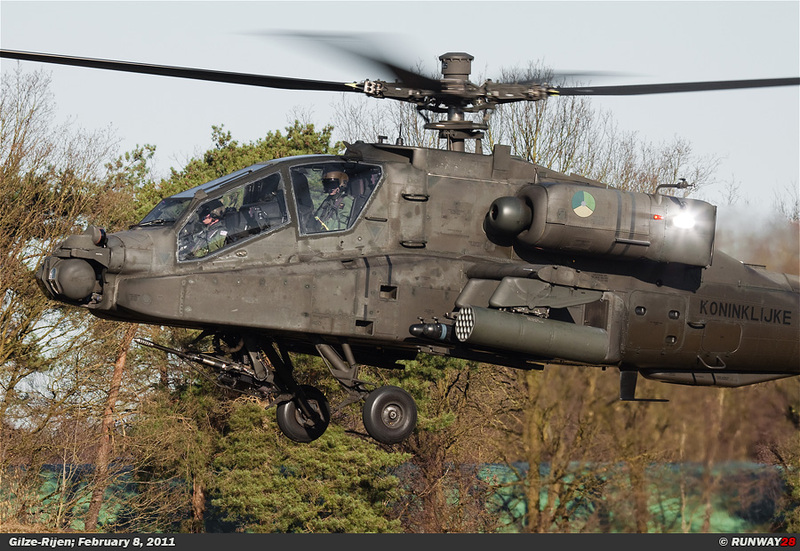 The Dutch AH-64D is equipped with all kinds of self-defensive and offensive armaments. 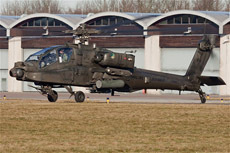 The protection of the helicopter comprises of; a laser warning receiver which warns the pilot when a laser beam is pointed at the helicopter, radar jammers which will interfere the enemy radar signals to make detection very difficult and finally the AMASS system which is able to detect missiles such as SAM’s and which is to drop flares for heat-seeking missiles. 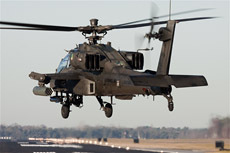 The Apache helicopter has various sensors to support the weapon systems such as an infrared camera for day and night vision, a video camera that can be used only during daytime and a helmet with built-in laser pointer target projection. 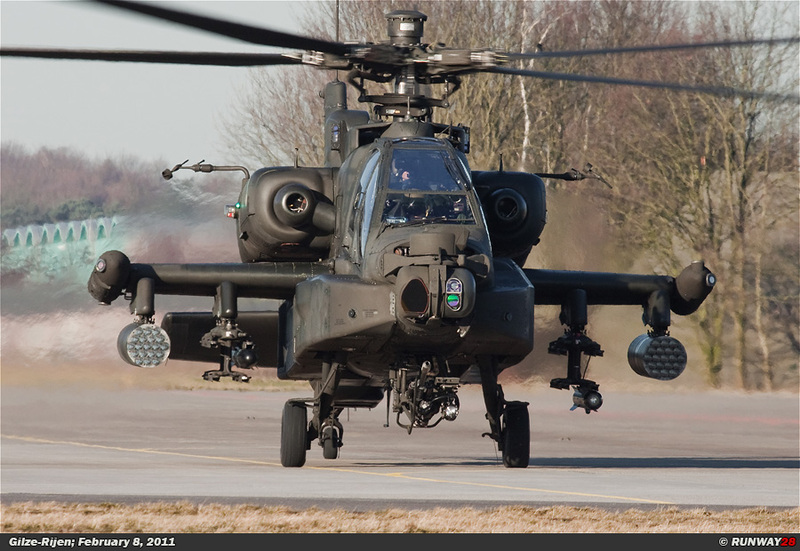 The standard armament of the Apache consists of up to 16 Hellfire antitank missiles which are mounted under the wings. 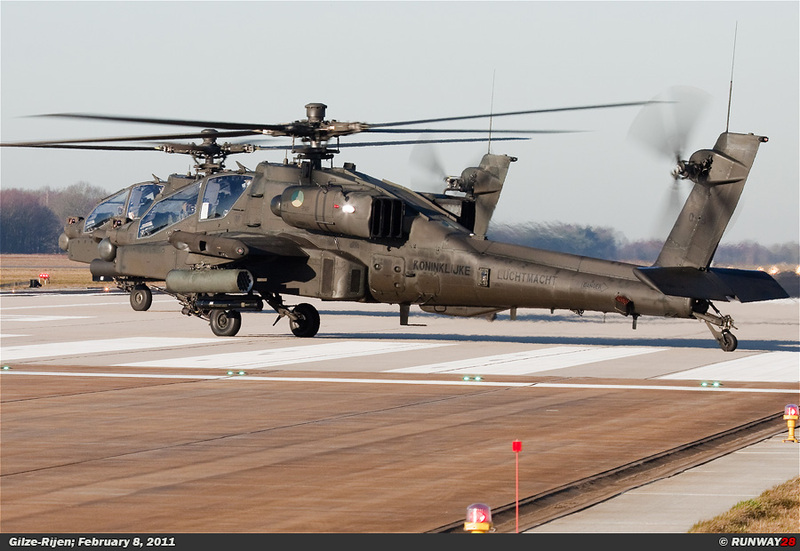 Additionally, the helicopter can carry up to 76 unguided 2.75 inch Hydra 70 rockets. 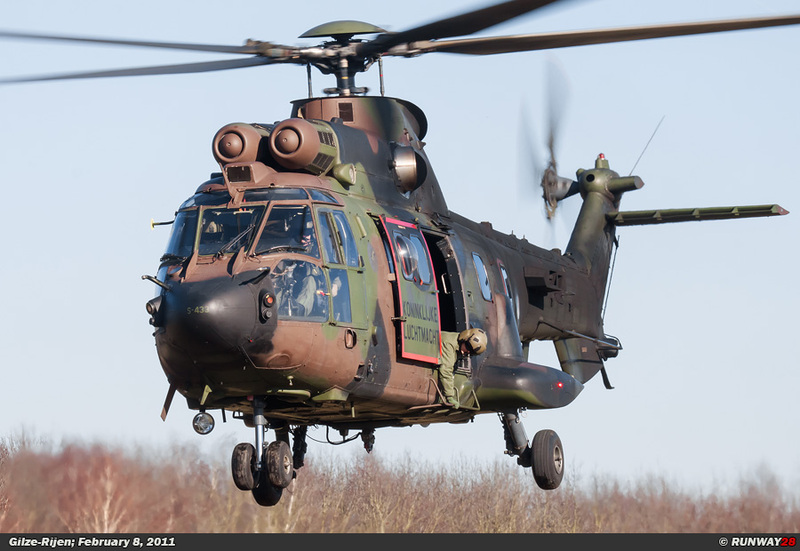 Finally, the helicopter has a 30 mm cannon under its fuselage with a stock of 400 rounds. 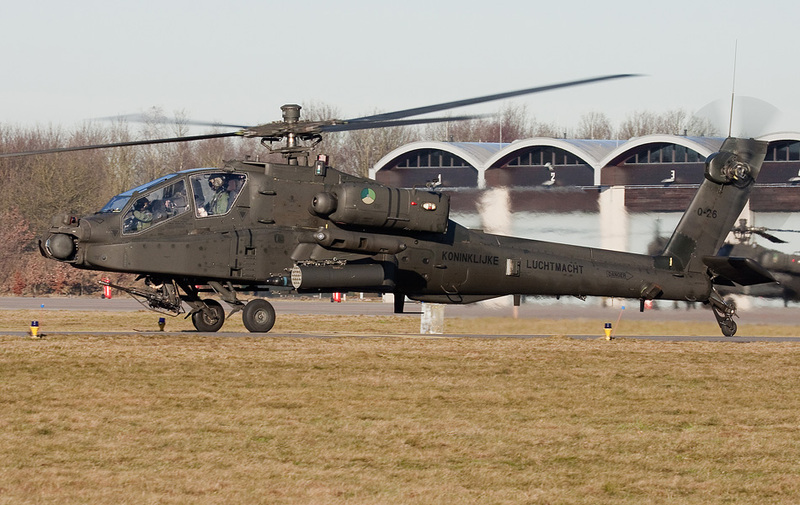 The 29 Dutch AH-64D Longbow Apaches are not equipped with the Longbow system and therefore no Fire Control Radar is mounted on top of the main rotor head. 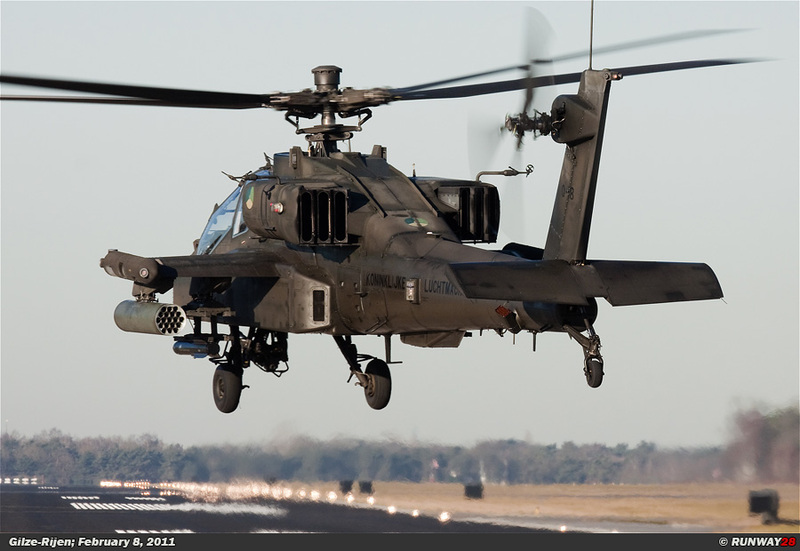 Furthermore, the helicopters do all carry the other innovations and therefore they call it also the "Radar Less Longbow”. Furthermore, the number of rounds for the 30 mm cannon is reduced to 400 rounds because of the additional Robby tank. This tank was used during the deployment in Afghanistan; there was never a shortage of round during combat. This tank can be removed which brings the number of rounds to 1200. Today I arrived at 9.30 am at Gilze-Rijen. 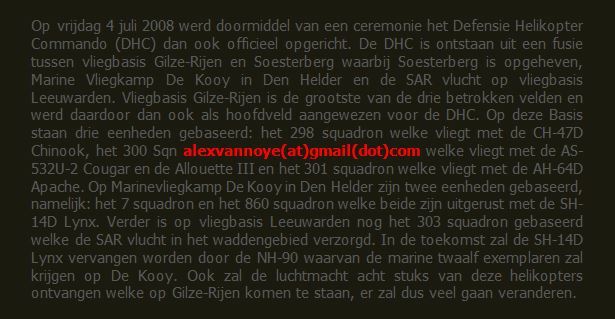 I just went to the base and was hoping to score a few helicopters of the Dutch Defense helicopter command. The weather was very good for this time of the year. The sky was clear blue and the temperature was about ten degrees Celsius. These were ideal conditions to photograph the helicopters of the DHC. Especially the Apaches of the no 301 Squadron would fly very well today. 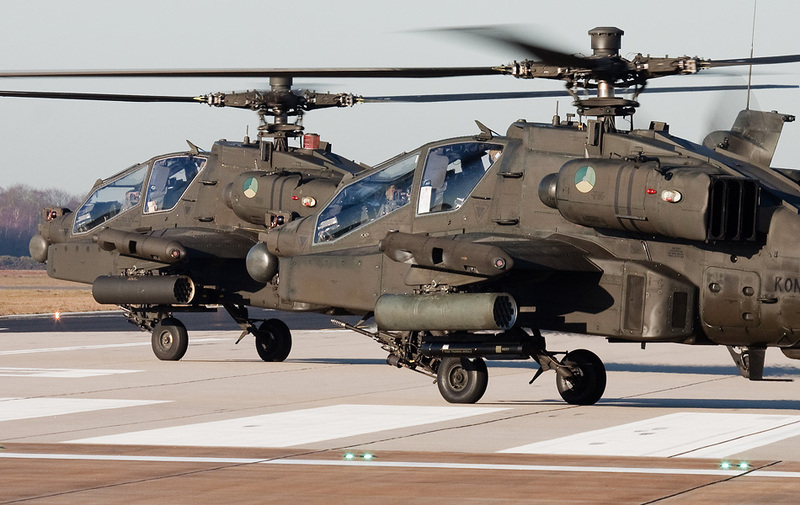 Four Apaches were starting their engines within thirty minutes after my arrival at the base. One Allouette III of the no 300 Squadron was flying circuits when I arrived at the base. 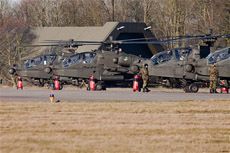 Five Apaches were on the platform being prepared. 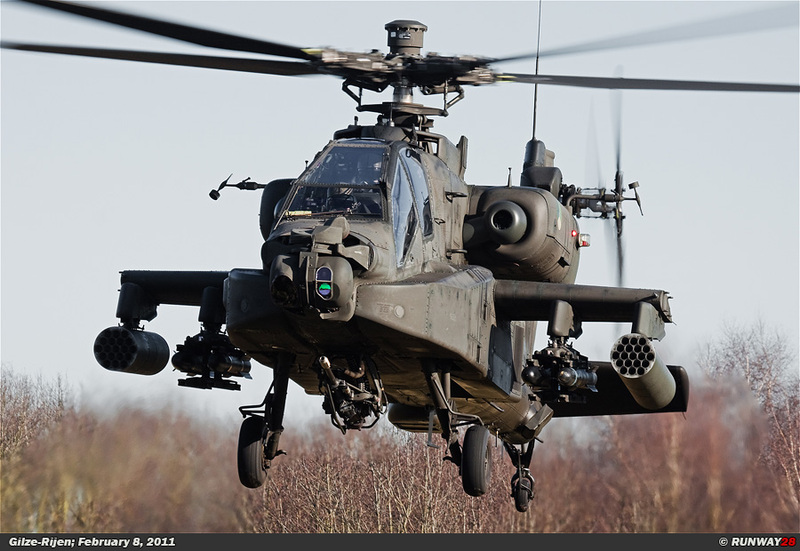 It did not take long before the first Apache was started. The pilots were climbing into the last four Apaches in the row of five and ground personnel were checking these helicopters. The first machine which was started was the Q-05. The other machines were undergoing their pre-flight checks at that time. 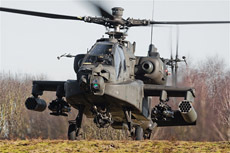 The rotor blades of the Apache started to move after five minutes. The Q-05 started to taxi. The question is always if they use the first or the second taxi track to the main runway. Unfortunately this Apache had chosen the second taxi track. There were two more Apaches started after ten minutes. This time it was the Q-18 and Q-26. 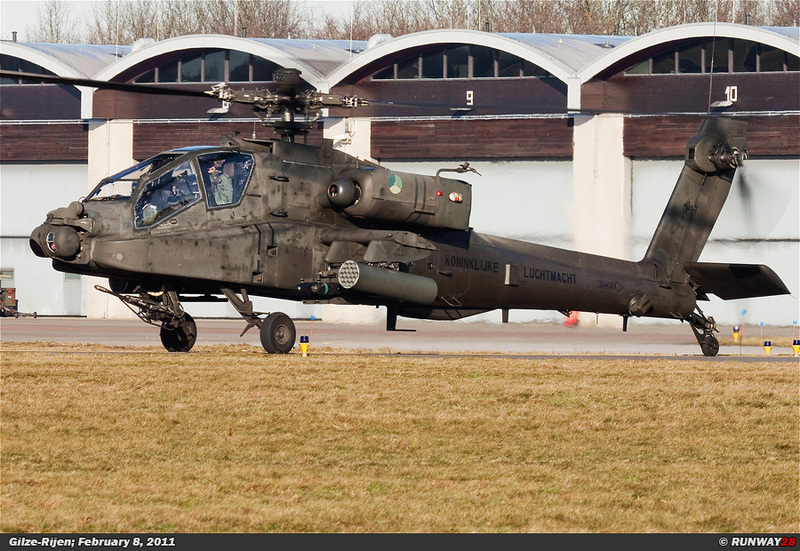 The Q-18 is a famous Apache for me, because I always see this machine just like the Allouette III A-301. 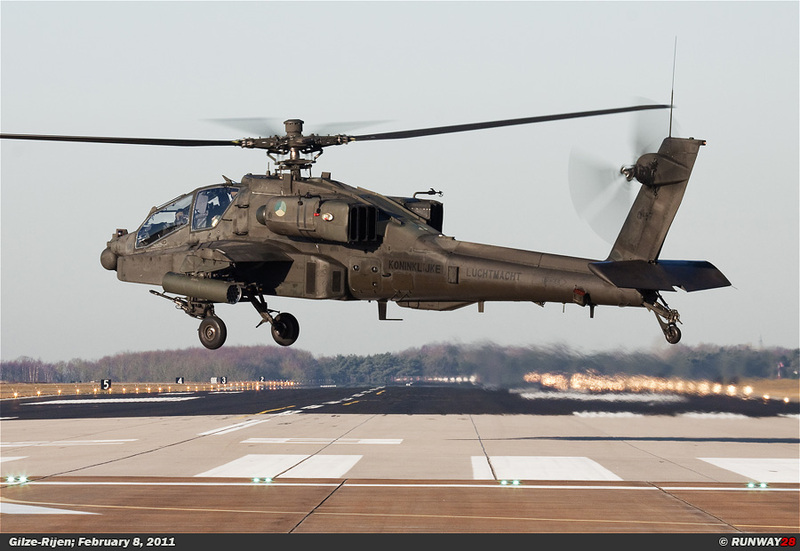 The Q-26 was a new Apache for me. The machines both began to taxi to the runway. I was luckier with these two machines, because they would use the first taxi track which is located right in front of me. I had the ability to photograph these two machines from a very close range. 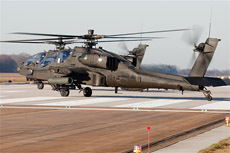 The two Apaches remained on the runway for a few minutes before they would leave. This gave me some unique photos. 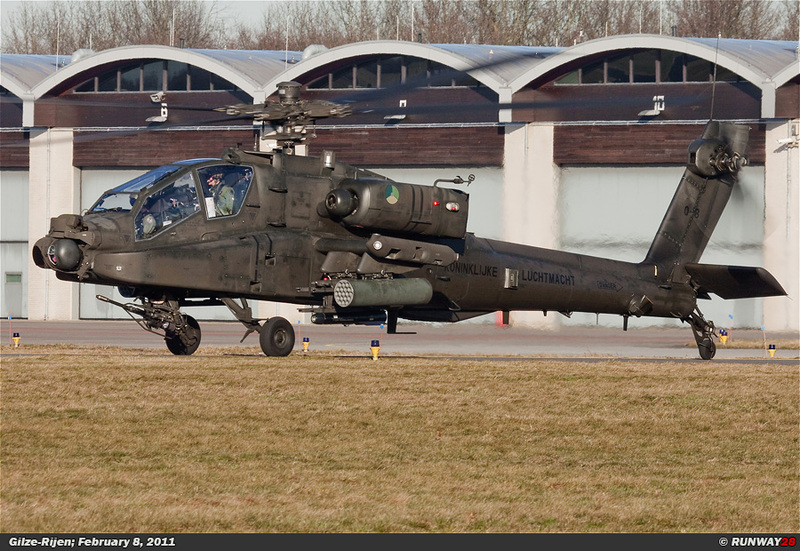 The fourth Apache was also started in the meanwhile; this was the Q-17. 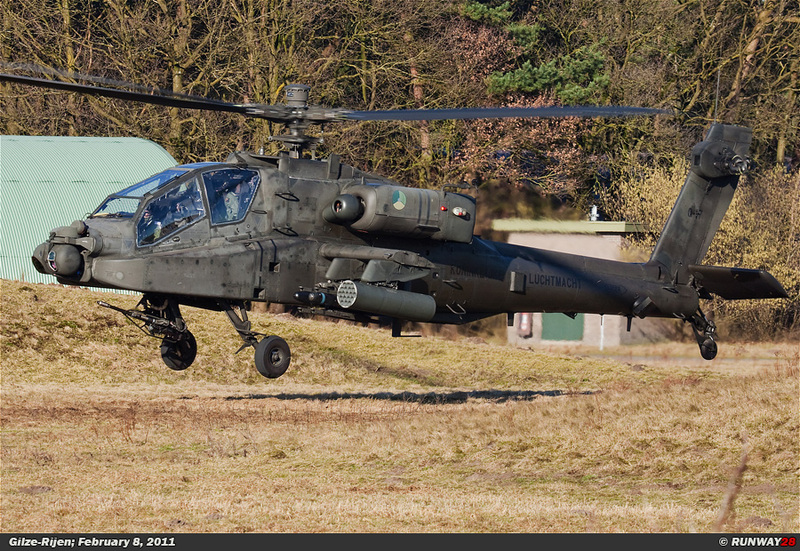 Also this Apache used the first taxi track. 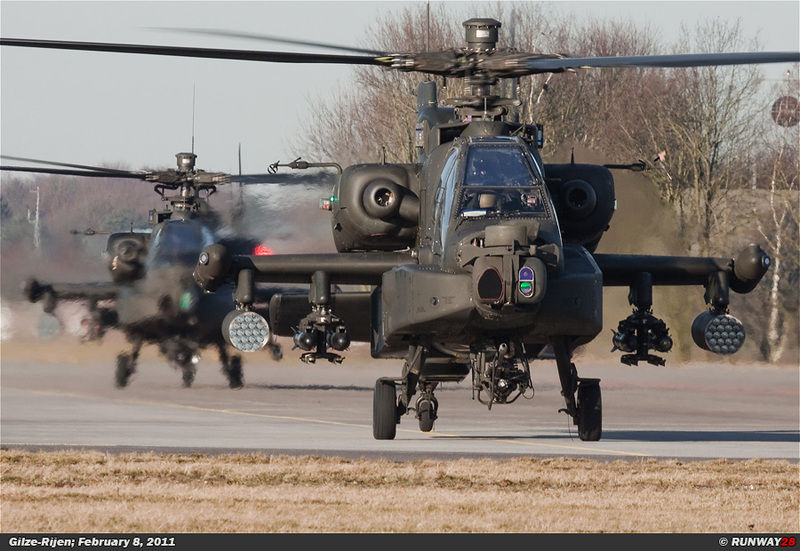 I was still at the head of the runway when the fourth Apache started to move. This helicopter stayed on the concrete as well for the next few minutes. The Q-17 flew away after a few minutes and started to fly circuits over the base. I drove to the Slopes at the south side of the base after the departure of these helicopters. The first movement took place within one hour at the Slopes. The Q-17 which I saw at the runway 28 before entered the Slopes area. I also saw a Cougar at the Slopes during the afternoon. I decided to leave Gilze-Rijen at 2.30 pm because I had everything on photo for today. 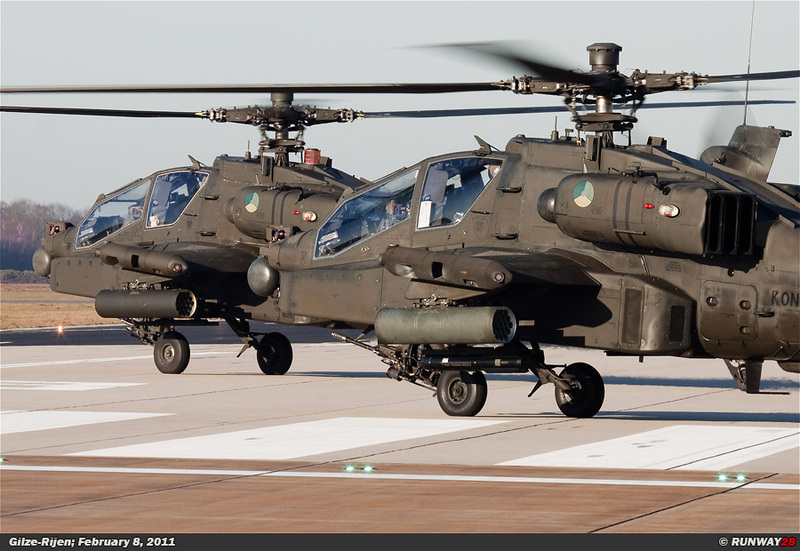 I saw two new Apaches and one new Cougar today.